The beautiful province of British Columbia offers an extensive amount of activities, sites, and landscapes to enjoy throughout the year. While the southern part of the province boasts the more urban areas, the northern area of British Columbia lets visitors enjoy a variety of historical, natural and cultural sites and more remote regions. Lose yourself in the multitude of Provincial Parks, or learn about the history of explorers, settlers, and the aboriginal cultures of the province. Experience the great outdoors as it was meant to be, with clean, crisp air and magnificent scenery. Northern BC has something for every traveller! Just 10 minutes off Highway 97, and 30 minutes north of Prince George, you will find the interesting Huble Homestead. Open seasonally, this site will take you back in time to the days of trappers, miners and settlers. This 54-acre park includes the original homestead and many other pioneer buildings and artifacts which detail the lives of the settlers of the region, as well as the Giscome Heritage Trail, which was once used by pioneers and First Nation people connecting to the Summit Lake area. This site operates by donation only, so please be generous! 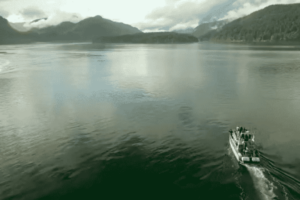 Many travellers think of BC as a common place to see salmon, and they would be right! This is an excellent opportunity to see sockeye and chinook salmon as they migrate back to the lake. This 670-foot-long fish ladder bridges both the upper and lower Victoria Falls, with 33 ascending pools! There is a public viewing area at the foot of the ladder, as well as an area where visitors can view operations. Visit in late summer for the best viewing, and watch out for the bears, eagles and wolves which frequent the area looking for dinner! If you are heading out on the Cassiar Highway to or from the Yukon, Jade City is a nice little spot along the road to spend a bit of time. A family run jade operation, this little destination has a population of about 20 people, and a mining history of about 40 years. 90% of the worlds jade comes from this area! Take a short ten-minute drive down to the abandoned mining town of Cassiar, join a guided hike, or learn everything you need to know about jade. As well, overnight RV parking is free. Anhluut’ukwsim Laxmihl Angwinga’asanskwhl Nisga’a – that might be too much of a mouthful for most tourists to handle pronouncing, and might likely be forgotten unless written down, but the landscape and scenery will be held in memory for a lifetime. As the first provincial park jointly managed by a First Nations tribe and the BC government, it is a fantastically unique destination. Take a guided tour through the most accessible volcanic areas, with a 3 km walk through old growth forest to an amazing viewpoint above the crater. Yes, we know this is more than one island and one site. However, Haida Gwaii was voted as one of National Geographic’s Best Trips in 2015, and we think it should be on the list every year. Along with the unmatched natural beauty of the Gwaii Haanas National Park Reserve, National Marine Conservation Area Reserve and the Haida Heritage Site, visitors can experience the SGang Gwaay UNESCO World Heritage Site, one of the last authentic examples of a west coast First Nations village. Keep in mind that it is necessary to make reservations!